AVALON ― The Catalina Island Conservancy anticipates the opening of the Trailhead Visitor Center next summer after having its groundbreaking last summer. The Catalina Island Conservancy’s Trailhead Visitor Center will be a place for visitors and the community to gather and obtain information regarding the island’s history, nature and conservation efforts as well as recreation. The three-story, energy-efficient facility will have the main visitor section on the first floor. Bluewater Café and event space for up to 125 people will be on the second floor, according to Catalina Island Conservancy’s President/CEO Tony Budrovich. A top deck overlooking the city, hillside and ocean will also provide learning opportunities. “Conservancy’s Trailhead Visitor Center has a total square footage of 9,050 (and total project of 12,500 sq. ft. which includes our jeep loading areas),” Budrovich wrote in an email to The Log. The Trailhead Visitor Center is another important component of Imagine Catalina, a 20-year master plan of developing infrastructures to make the island’s recreation, education and conservation more accessible. Another element of Imagine Catalina was Trekking Catalina, which the conservancy has completed 27 miles of expanded trails making a total of 165 miles of hiking trails and roads. Information on hiking, biking, camping and other activities will be available at the visitor center. Budrovich said the center will be open daily from 8 a.m. to 5:30 p.m. with the exception of three days for observing holidays. Total cost of the project’s construction and design is $14.6 million, according to Budrovich. 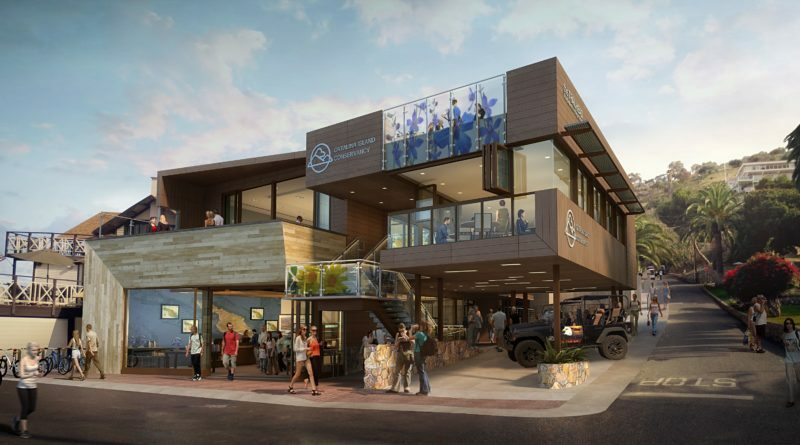 The Catalina Island Conservancy has been privately fundraising to pay for the cost of building the visitor center, and $2.1 million still needs to be raised. “We have a capital campaign that is active, and we are basically asking people who cherish what the conservancy stands for to help us build our visitor center,” Budrovich stated.